Passengers have travelled on a zero emissions bus or "green bus" for the first time in Ireland as part of a national trial of low emission buses. The biomethane-powered bus is one of a number of options, which have been trialled in Cork and Dublin since last December. These include full electric, hybrid-electric, hydrogen and compressed natural gas/biogas alongside retro-fitted diesel buses. A ban on diesel buses being purchased for State transport comes into effect from July and the trial's findings will inform the future purchase of urban public buses. The low emission buses have been travelling on specific routes in Cork and Dublin to test their performance under headings such as air quality impacts and CO2 emissions, but have been weighted rather than carrying passengers. Unlike diesel buses currently in use, today's trial bus will have a zero carbon emissions footprint. Biomethane is produced naturally from the anaerobic digestion of organic materials and leftovers from agriculture, food production and waste processing. 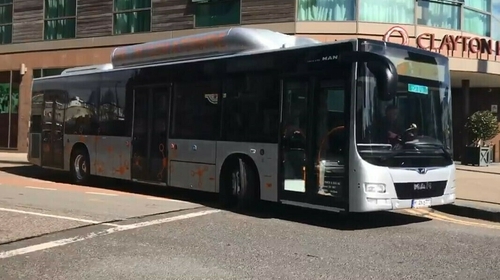 The first passenger bus journey picked up from Lapps Quay in Cork city this afternoon and travelled to the SFI funded Centre for Marine and Renewable Energy (MaREI) in Ringaskiddy.